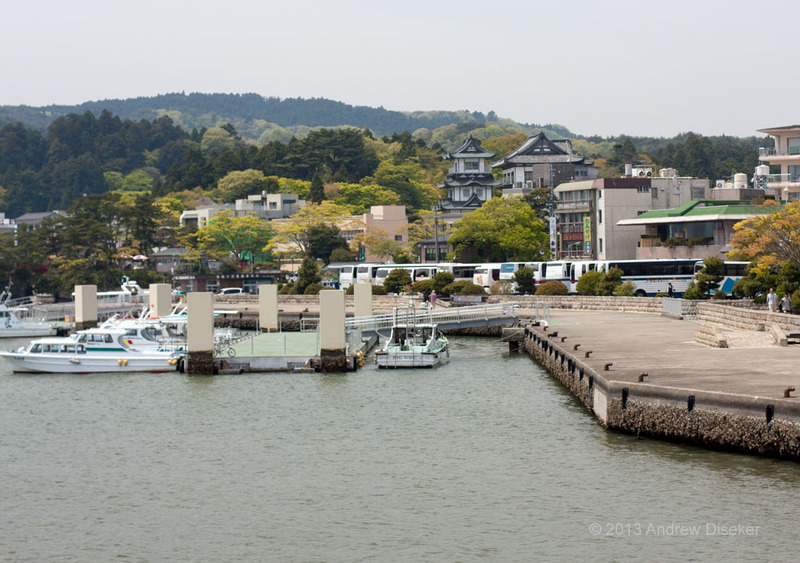 Matsushima, two years later (pt. 2) – Nerdwatch! When I was there in 2010 with my brother, it was a beautiful spring day, the town was getting ready for the big tourist summer, and no one knew that in less than 1 year the whole area for hundreds of miles would be shaken, flooded, and washed away, and there would be an unimaginable number of deaths. 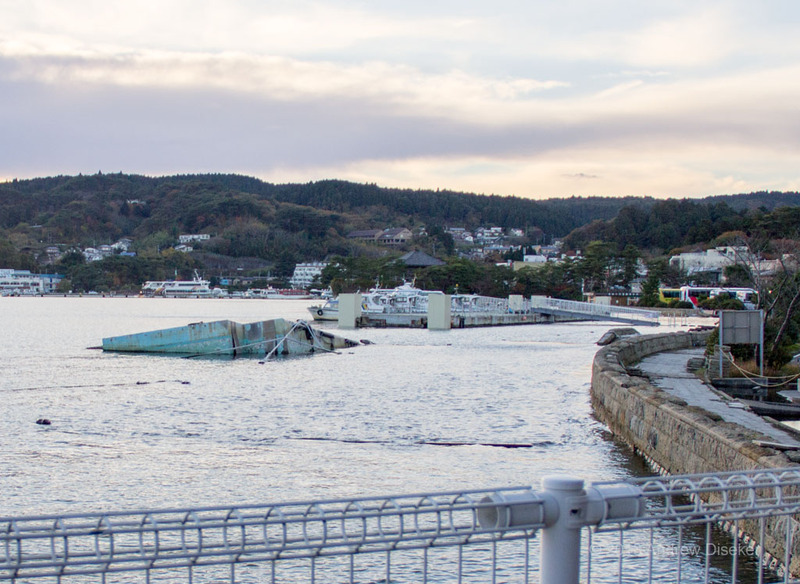 Due to the geology of Matsushima Bay, with its hundreds of tiny islands scattered around, the town managed to be spared the brunt of the force from the tsunami, but it could not avoid the rise of the waters. Nor could it escape the power of the earthquake, which rocked the land and even drove part of it further down into the sea. The town also lost several lives, from drowning and other causes, which they are still recovering from. This is a picture of the floating docks near the seawall around Matsushima Bay, close to the large island nature preserve, Fukuurajima. As you can see, in 2010 there was a wide walkway in front of the seawall, with the dock attached to pillars which kept it in place when the tide rose and fell, and a bridge leading to the walkway. This picture was taken at low tide, and you can see by the barnacles and other growth along the bottom of the walkway, the high tide never rose to cover it. When I returned in 2012, 18 months after the tsunami, I found a much changed Matsushima. At high tide, the ocean now came all the way up over the walkway and in places broached the seawall. Some trees behind the seawall were damaged or removed, and a piece of the floating dock was no longer attached, which is the piece sticking up out of the water. According to the locals, the land around the bay subsided by about 1 meter, which meant that a lot of accommodation had to be made to adapt to the new geography. I have other pictures to show that, in another post. This was a striking change, though, and something that will be a constant reminder to the people of Matsushima of what they have lost. Like people everywhere, however, they have been and are adapting, rebuilding, and doing what they can to recapture the feel of the pre-tsunami town. Many things still survive, and many things are being restored, along with new things to replace those that can’t be recovered. Matsushima will make it, because it still has the beautiful natural islands, the vision of which still makes it one of the three major sights of Japan. I will go there again, maybe not soon, but at least one more time in my life. I wish I could take everyone I know to see it, as well. Tagged earthquake, effect, geology, hope, loss, Matsushima, Matsushima Bay, rebuilding, recovery, sadness, tides, tsunami. Bookmark the permalink. Pingback: Matsushima changes – 5 years and 2 years « Nerdwatch!